Starting from assisting Chris’ father during high school, doing floor stripping and waxing, carpet cleaning and general floor and building maintenance, and eventually taking accounts over due to his dad’s medical issues, Chris managed a couple jobs while still in high school. Chris, working full time at a cleaning position for Medford Township Schools, he also continued to work and manage other accounts thru college. Seeing an opportunity after graduation we launched our maintenance company offering all facets of building maintenance: regular daily cleaning, periodic carpet & floor care, all the way to complex maintenance programs for large clients, multi tenant and multi building clients. 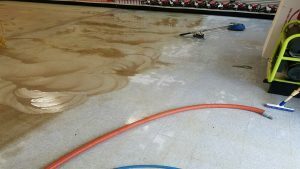 Everything they needed we did- from implemented carpet cleaning programs and stripping and waxing programs, anything they needed. And always, we combined traditional methods with newer technology. Whether teamed with a single individual, or a team of 6, even 15 employees nightly, we delivered. No matter the project, from simple to high demanded ones we delivered, no matter their type and need. At one time we maintained several car dealerships simultaneously, bank locations, doctors, lawyers, accountants, and real estate offices, as well as municipal complexes & libraries. We worked with manufacturing facilities, medical centers, including surgical centers, dialysis centers, and out patient emergency rooms. We also maintained several golf, tennis & sporting clubs. And, we capably managed a multi-tenant conglomerate of buildings (9 Bldgs nightly, maintained by a team of 14) for a property mgmt company, as well as 9 Locations for our local Public Utility- Public Service Electric & Gas. At the height of our service, the PSE&G staff admired our cleaning program at their flagship location in Moorestown. They were so impressed with all 8 locations we maintained that location and 8 others they sent a team down from Corporate to study our maintenance plan. Their goal, was to mimic it with intention to rolling it out company wide. As folks may recall, the Recession of the 1980’s was a tumultuous time for commercial real estate and businesses serving that industry. Vacant commercial property was abundant, companies were going bankrupt, and it became difficult to stay in business because there was so much volatility. It was a perfect time for us to re-brand, and frankly simplify our lives. We evaluated our business plan, heavily invested in training, equipment and technology and began working and serving residential clients with their various specialized, or “technical” cleaning needs. At the same time we made ourselves available for the periodic and specialized needs of our commercial clients, although no longer on a daily, weekly or monthly basis. If you are a Building Owner or a person given the task of looking for help for the carpets and floors give us a call, we can answer your questions, discuss your project and needs, get you a free estimate. Let our experience work for you! Whether north in the greater Princeton area, local in the Burlington-Camden County area, or located along the coast (of NJ), west to the King of Prussia area, or points south to northern Delaware and Md, we can get you covered! Call us at 609.953.0472 or contact us online.